One element of reading instruction for early learners is word work. "Word Work" are exercises that help students firm up vocabulary, letter knowledge, rhyming skills, and other phonics skills. Word work can be accomplished in a short amount of time per day and can often be connected to the reading you are already doing in class or with your child. Here are a few of our favorite winter theme books and the word work activities that accompany these books. The Hat by Jan Brett. In The Hat, a girl named Lisa is washing her winter woolens and hanging them out to dry. Along comes a hedgehog and gets his prickles stuck in one of Lisa's stockings. The other farmyard animals laugh at Hedgie's hat, but finally decide they like his idea for a hat. The Mitten by Jan Brett is a classic winter story. In this story, a young boy's lost mitten becomes a home for forest animals. When a tiny mouse causes a bear to sneeze, the white mitten flies through the air. The lost mitten is recovered by the boy, Nicki. Word work time can be used to help students understand words. One fun way to do this is to have students sort words or picture cards. These vocabulary concepts can be drawn from the books you are reading. In our winter word work, I used the concepts from The Hat and The Mitten. The Hat is set in a farmyard and focuses on farm animals like hen, goose, cat, dog, pig, and horse. The Mitten is set in the forest and includes animals such as rabbit, mole, fox, badger, hedgehog, bear, owl, mouse. Have students sort forest animals from non forest animals or categorize forest animals versus farm animals. The author of both books, Jan Brett, has tons of free printables on her page. One free PDF is a mitten with animals from the story to cut and paste. Children can cut out non forest animals for the other mitten. After sorting the animals, it's a good idea to have individual students write about the animals. Children love to make collections. Give children blank stapled books and magazines. Let them cut and paste animals that would fit into a given category, such as forest or farm. If the child can write words, he can label his collection or an adult could label with him. Word work is the time when children work on letter names and sounds in isolation. The letters that are covered in a lesson can be letters that a child doesn't know or are partially known. Sometimes it is fun to make the study of letters seasonal or relate them to a story. When reading the books, The Mitten and The Hat, children can contrast the letters M (mitten) and H(hat). 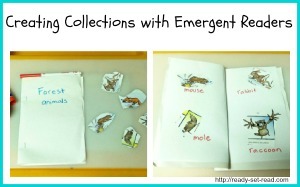 Emergent readers can contrast these sounds by using picture cards. Show the child the letters they will be contrasting and show them the anchor words (mitten,hat). Give the child the picture cards one at a time, the child should say the name of the picture and place the picture with the correct letter. In my free pdf, Hat and Mitten Winter Word Work Packet, I have picture cards for practicing these sounds. 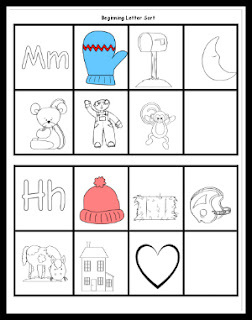 After completing the M and H sort together, children can cut and paste the M and H sounds onto the mitten and hat on the Mittens and Hats worksheet included in the packet. 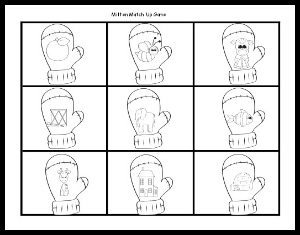 Children who already know most letter sounds might enjoy playing "Mitten Match Up" after reading the book, The Mitten. 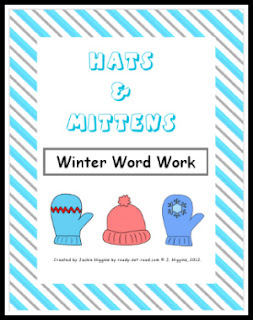 This game is also included in the Hats and Mittens Winter Word Work Packet. To prepare this game, label a clothespin with each letter of the alphabet. Cut apart mitten cards that include pictures for each beginning letter sound. Children will hang the picture on the clothespin that matches the beginning letter sound. Word work is also a good time to practice rhyming words and word sorts. When practicing word families it is helpful to give students an anchor word to illustrate the sound they are listening for. When reading the book, The Hat , students can practice the -at family with the anchor word hat. When reading The Mitten, students can practice the -en word family. For young readers who have few sight words, this is best accomplished with picture cards. Students can sort picture cards into the correct word family. Show the child the anchor word pictures mitten and hat. 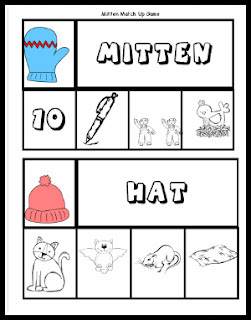 Hold up each picture card and have students determine if the word rhymes with mitten or hat. After working as a group, students can cut and paste the rhyming words on the Winter Rhyme Time Work page. This skill can be practiced by older learners who have are beginning to decode. The picture cards can be replaced with word cards for the sorts. Then children can write a list of rhyming words for each word family. You can get my entire Winter Word Work packet FREE in my Teachers Pay Teachers Store. This product will be best with emergent to very early readers. I'd love if you'd rate my product and follow for more freebies. 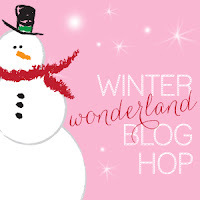 I wrote this post to participate in a Winter Wonderland Blog Hop. You can find tons of amazing Winter activities for kids in this blog hop. There are book ideas, craft ideas, cooking, learning activities, and more. Here's where you can find all the Winter fun! Thank you for this printable! I am right now doing winter-themed activities with my son and this will be fun to include for him :) The link goes to the Zoo Book Activity page on TPT site. JDaniel will love these. Thank you f for stopping by my guest post.